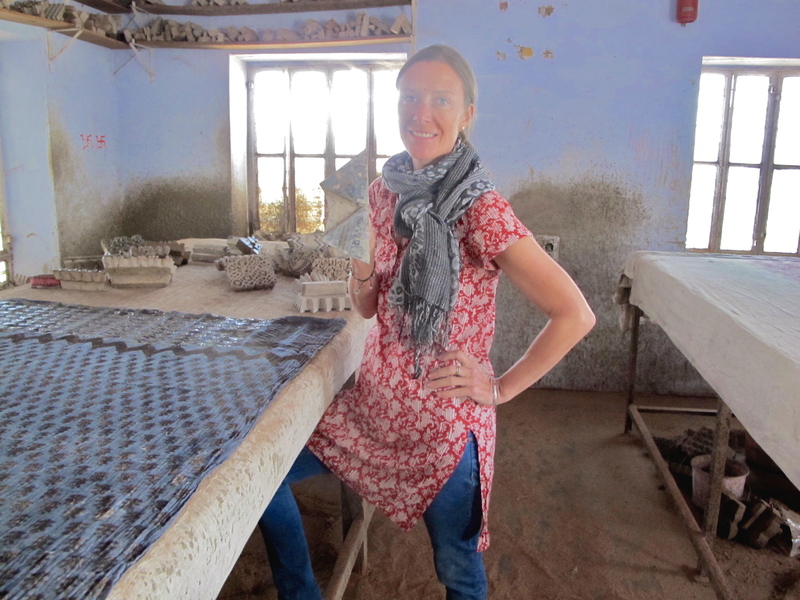 Meet Ondi McMaster-Chullil, yoga adherent and founder of mindful textiles & clothes company in India, AtelierOM + OM khadi She started her business because of Gandhi. I don’t follow gurus but I saw video by one, not too long ago and it made me think over and over again. This “happiness guru” said: a smart person does what they love. A genius does what they must. It stayed with me when I travelled to India earlier this year. That saying came to life when I met Ondi McMaster-Chullil. She was one of the yoga teachers at the Artjuna Cafe in Goa, India. I would later learn that she made clothes that I love, basically the main things I bought for myself in India. I know it’s not entirely possible and that our egos serve us as humans in specific ways, but Ondi –– as a teacher –– seemed to be egoless. She was there, for you as a teacher. Some weeks later I found out she made clothes, and the shop I had been admiring next door, was hers. I would later learn that Ondi, at least to me, and at least in this moment was one of those geniuses that does what she must. And she would be one of the women I would need to know better as I try to understand my own path to womanhood, personhood. We usually throw our heart’s values out the window when it comes to work. Most of us work for others, with a value culture already instilled that workplace, or we have to bend what works with our freelance or small business dreams in order to make real money for ourselves and family. Ondi felt different. She hasn’t stepped out of society, she’s glued herself into the middle of her world, a world she cares about, a world she has the power to transform. She lives in India, but is also connected to the Western world. 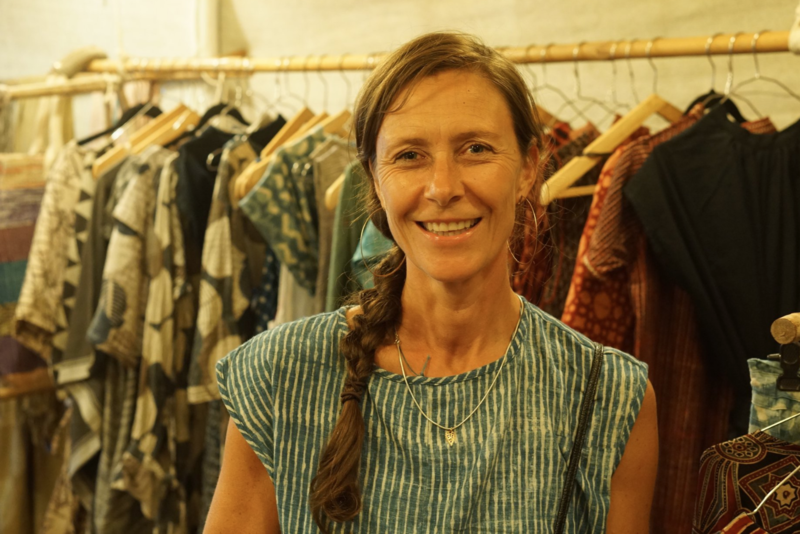 Find her in New York and the West Coast this summer as she makes and sells her special sustainably-made clothes in India and around the world. 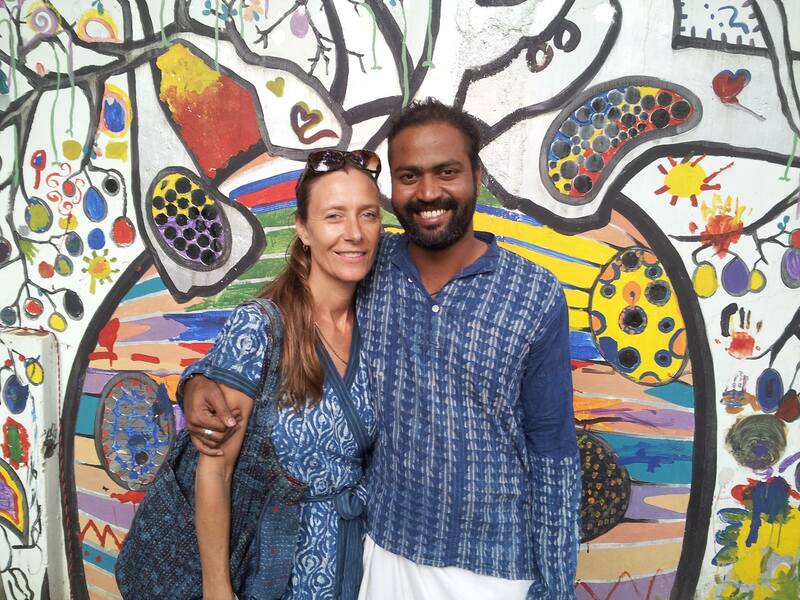 Ondi is married to an Indian man whom she met at the Gandhi Ashram. He is a South Indian, from the Kerala Tribe, a warm group of people believed to be among the “original Indians,” says Ondi. Today you see a lot of mixed races but their tribe is more ancient, the Dravidian Race she explains: “Our meeting at the Gandhi Ashram was synchronistic. 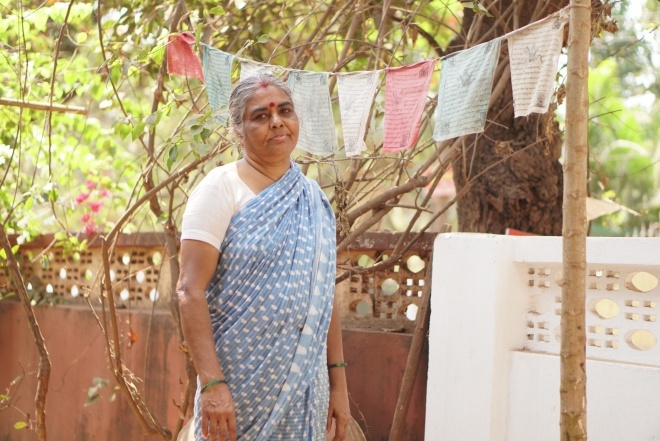 I started my business because of Gandhi,” she says. Accepted to the National Institute of Design in 1995 to study textiles yet decided against it due to financial costs, she went on to travel independently and study craft makers across India in the 90s, “I needed a mission. If you come to India without one you will get one pretty fast,” she says. 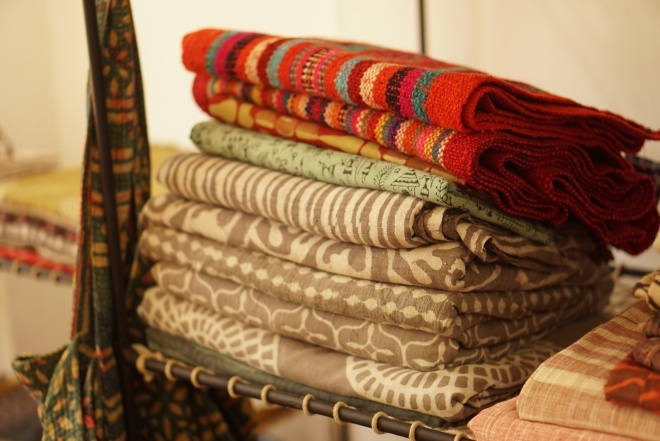 OM khadi textiles are hand spun, hand woven, the way Gandhi had encouraged the Indian people to “spin” as an act of resistance to industrialisation”… during their Independence movement in the 1940s. One of the craftswomen that works with Ondi to create the Atelier Om look. 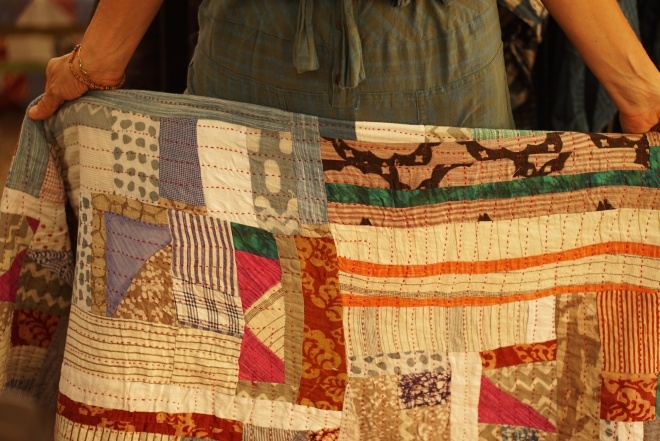 A total of 50 different fabrics can be found on the floor of her small showcase store in Anjuna, and she carries a similar and wide variety of products at the famous Saturday night flea market. 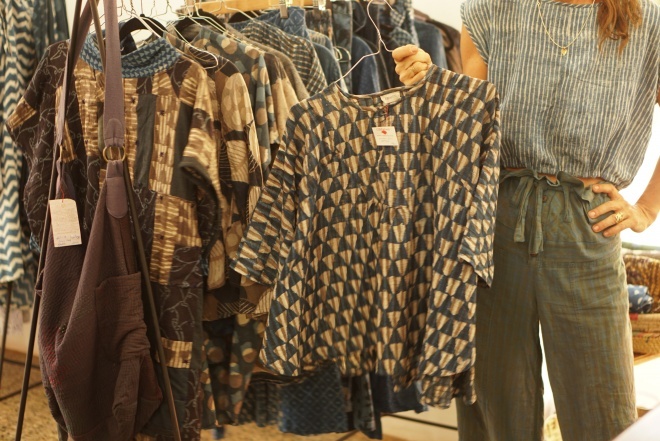 Some of her materials are pure organic cotton, silk and cotton weaves, linen or non-violent silk. 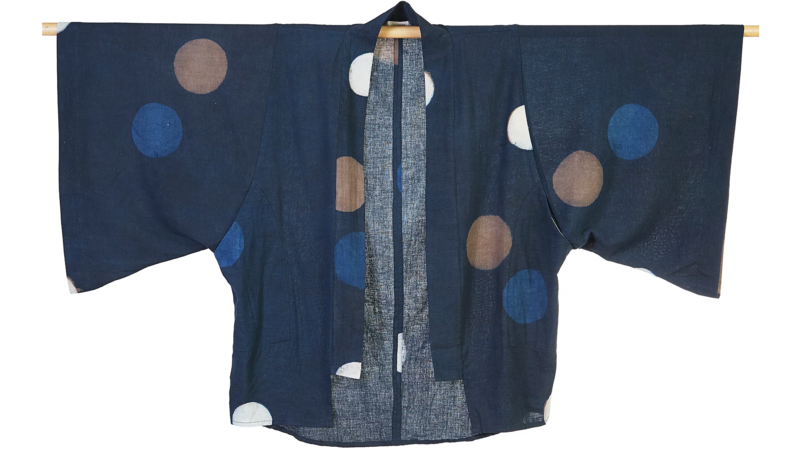 She uses all natural dyes in blockprinting, like indigo. You can “feel” Ondi and her process in the clothes. I ended up splurging and bought 4 coats: an overcoat (the same one owned by Lenny Kravitz she tells me and which is very Japanese), a kimono, a hand-dyed navy blazer and a pink wrap jacket which reminded me of the caftans from Azerbaijan. Compared to shops like H&M or Zara, you can’t compare her pieces to a mass manufactured piece of dead weight. You feel the difference. Your soul does, for sure. This resonates with me, because I used to be a potter. She goes deeper still. “Dosha” is an ephemeral sheath on our body. There are finer sheaths there too, until you reach the first one, the closest to your native spirit in its pure form. It is organic, made of this world. I watch Ondi go through her things, showing me the patterns, the designs. She’s a woman but carries an innocence with her. She’s strong, beautiful and has a gorgeous body. You can see it. But she’s not exaggerating it. Her clothes accentuate this “sensual” energy or sheath, not the often vulgarized sexual energy played up in fashion today to sell clothes to teenagers. We agree that women in burkas are an extreme revolt against this sexualization. Or it’s the “Catholic School Girl Mentality, telling us we can’t so we do. Patriarchy is exerting its last hand on us,” she prophesizes. “It’s killing us and invigorating us. We need to find the moderate way. Clothes can help us, with a “need to be more discriminating in how we act, clothes as a sheath on us, clothes give meaning,” she explains. OMkhadi, the clothes started as an art installation with Khadi since the hand spun fabric was that which Gandhi always promoted. “And I did some costume design for film and TV around this idea and some world’s came together about the consciousness of materials. I wanted all of those worlds to collide,” Ondi explains. Look at the result? 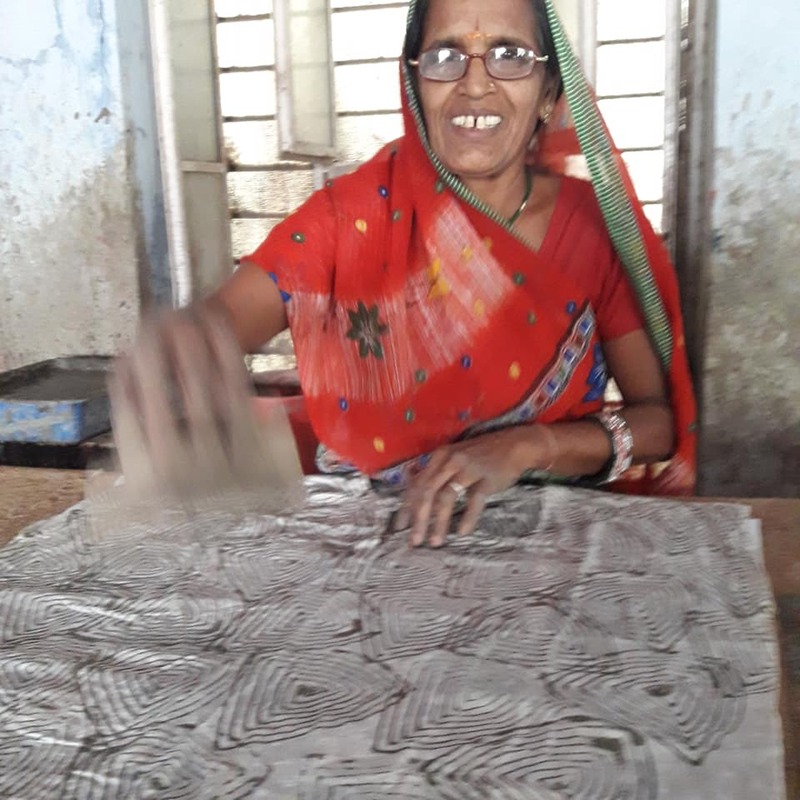 She does all her hand blockprinting by hand, twice a year. Then works with the raw materials to pull them together into pieces you could wear for years. 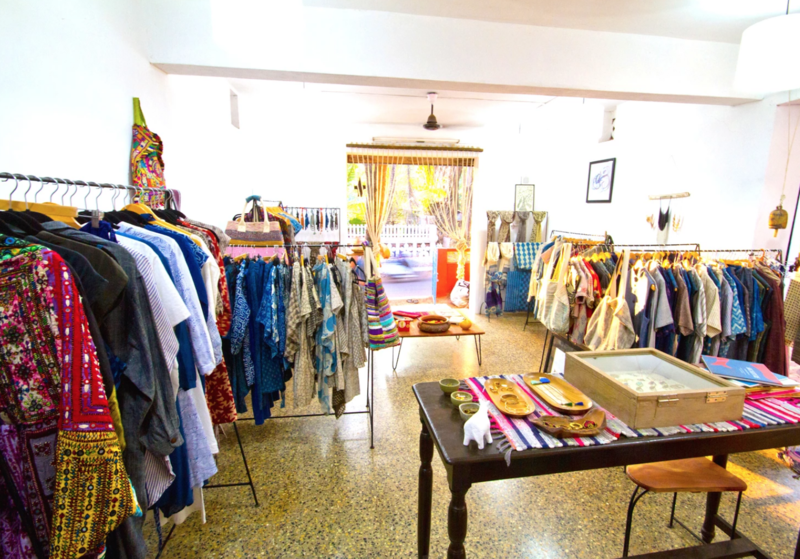 While it’s best to travel to Anjuna in Goa to go to her shop or to visit Ondi at the famous Saturday night flea, she does pop up shops in New York City and on the West Coast in the summers. Be in touch here for OMkhadi coming near you. Turns out one of the style of coats I bought is also owned by rocker Lenny Kravitz, says Ondi, not supplying more details. I am sure he feels like a rock star when wearing it. Also Ondi is producing a few boutique travel India tours so people can also meet what she loves and knows about the crafts, flavors and movements of India. Follow her on Instagram to get the latest. Previous Previous post: Does Your Mood Depend On Coffee?